Background: In the past decades, the hydroboration reaction was serendipitously discovered which occurred by the facile addition of diborane to alkenes and alkynes. Hydroboration reactions produce organoboranes. The organoboranes have marked a new era in the field of organic chemistry because they are versatile chemical intermediates that are readily available to chemists. 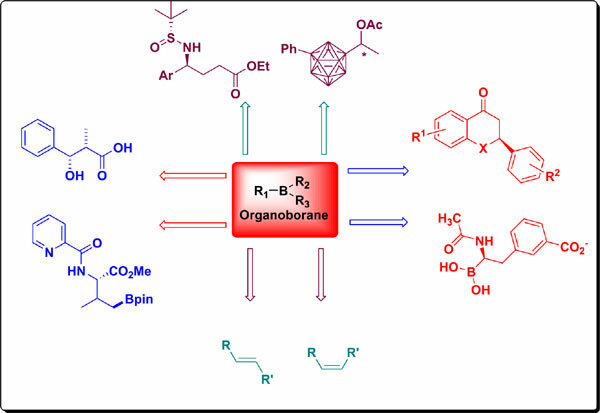 Objective: The review focuses on recent advancements in organoborane reagents in asymmetric synthesis. We searched the scientific database using relevant keywords such an asymmetric hydroboration, organoboranes etc. The quality research papers were included in the review which discusses the asymmetric synthesis via organoborane compounds. Conclusion: The development of organoborane compounds increased remarkably in few years after hydroboration reaction discovered. Later on, new selective hydroboration agents were developed (for example thexylborane, disiamylborane, dipinylborane, 9-borabicyclenonane, and diisopinocamphylborane which have proven valuable in syntheses of organic compounds with new carbon-carbon bonds. H.C Brown and his co-workers established various procedures to synthesize asymmetric compounds with high enantiomeric excess (ee). There are many different types of strategies in the asymmetric syntheses, but asymmetric syntheses via chiral organoborane reagents have proven to be truly general and have been used to achieve reactions resulting in excellent ee. This review focuses on the advancement. Asymmetric synthesis, chirality, borylation, organoborane, hydroboration.